In order to investigate the location of Himemiko, she started to decipher old books in the archives together with Kagemochi. After I bowed my head deeply, I returned to my room once to call Imari-kun. Hearing that we might be able to obtain information related to Himemiko-sama, Imari-kun was overjoyed. Pushed by Imari-kun’s words of “Let’s go right now!” we headed to the archives with light steps. We were greeted by a mountain of old books that were piled high. As I felt troubled, the archive door suddenly opened. As promised, in the dimly lit archives, Kagemochi-san sat beside me and I was studiously taught the letters of “Shinga”. It was a distance where I thought that if we were to look at each other… our lips would touch. My heart pounded. After Kagemochi-san smiled he picked up a book that had been left open on a desk. And, allowing one clan that was worthy of uniting “Shinga” to drink her own blood, she bestowed to them power. Hearing Kagemochi-san’s explanation, I suddenly had a strange thought about Himemiko-sama. … In this moment, once again, I was made aware of just how much value my own blood has during a battle. Saying that, Imari-kun bowed his head and then went out of the archives. After I parted with Imari-kun, I returned to the archives alone with tea and a candle. After I innocently closed the archive door tightly, Kagemochi-san smiled with downturned brows. 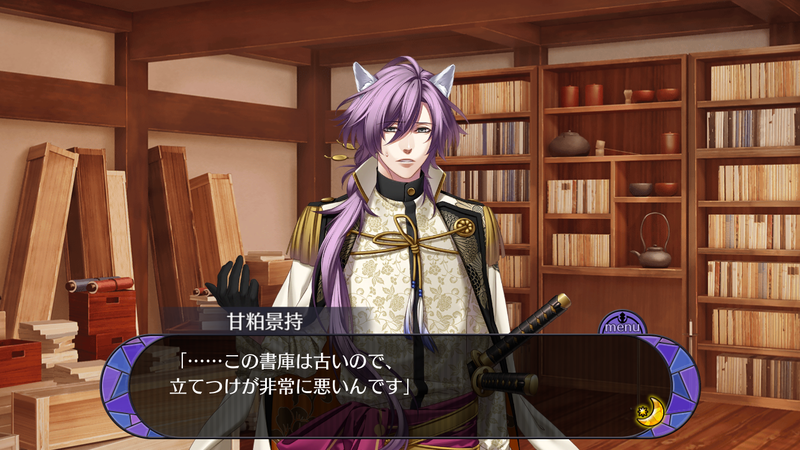 Looking at me as I tilted my head, Kagemochi-san opened his mouth as if he had difficulties saying this. (T/N: HOMETES PLEASE. Uesugi is busting out the complicated stuff now. So, this 4 kanji title is actually part of a long quote from Confucius which goes like “The wise delight in water, the virtuous delight in mountains; the wise are active, the virtuous are tranquil; the wise are joyful, the virtuous are long-lived”. I don’t, uh, actually know what this means and if Confucius is advocating one or the other or both. 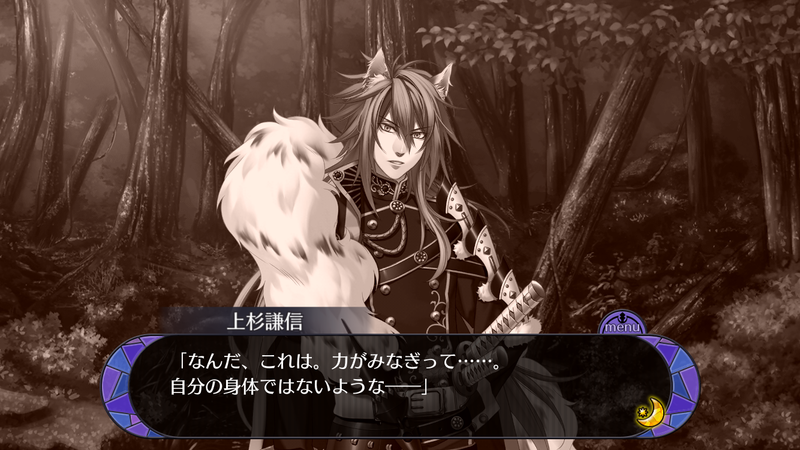 This entry was posted in Collaboration, Otome Games, Sengoku Night Blood and tagged Fujiwara Natsumi, Kadokawa, Marvelous!, Midorikawa Hikaru, Mobile, Otomate, Toriumi Kousuke. My heart is beating like a drum until the next chapter ended >///< I would never learn anything from his teaching unless his voice is muted haha. 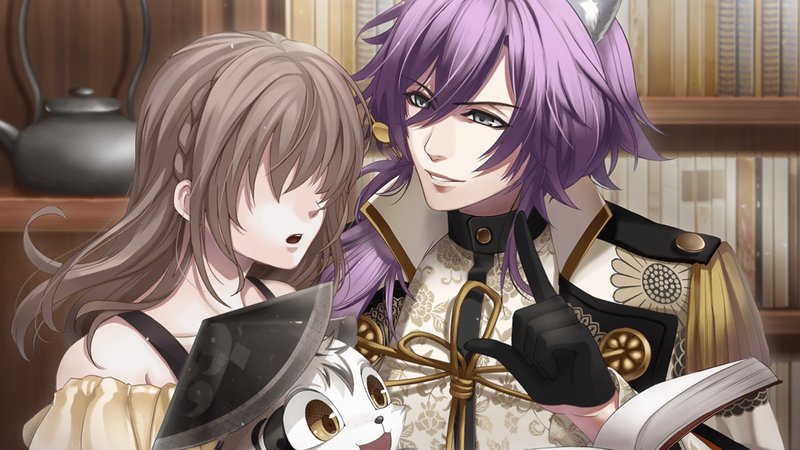 Poor Yuzuki being surrounded by charming men in the castle, also feeling jealous of her now. Re-the female gekka tribe, if my memory is not mistake, there was one woman in one chapter of Takeda route? When Masanobu was running away from her to Yuzuki's room. Yuzuki herself even thought that female gekka tribe is amazing. But I might translate it incorrectly. The reason why we don't see them often might be because it is otome game LOL ignore me. Thanks as always & take care! SAME SAME. I am so weak to Kagemochi I would have already been like “YOU CAN STAND AT THE OTHER SIDE OF THE ROOM AND TEACH ME! !” or else I’d be huddled into a ball to escape his voice. Haha, Uesugi’s chapter titles are certainly making me feel cultured since I have to dive into different sources to try and find what it’s referring to or what it means. 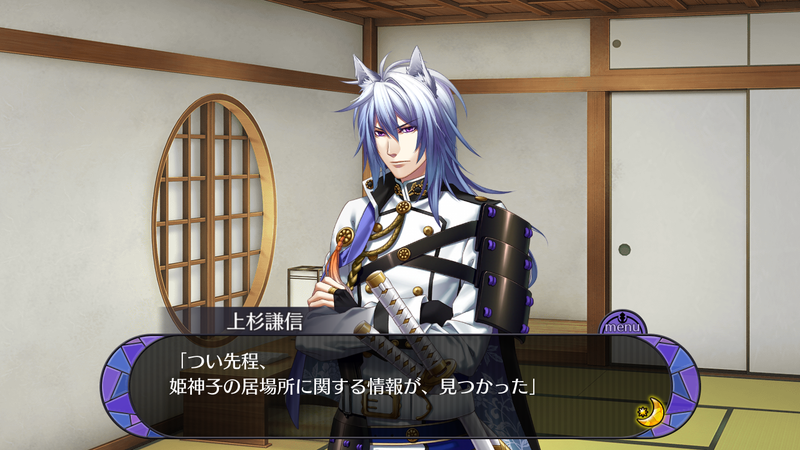 Whoever wrote Uesugi and Takeda’s route really enjoys idioms. I don’t recall there being an explicit mention of a female Gekkazoku apart from Kenshin’s sister and Kojuurou’s sister. Whenever the guys refer to females staring at them I always just assumed they’re females since they don’t say otherwise >< Like IIRC Masanobu gets stared at by the town girls whenever he's outside, haha. And I think she was just impressed by the stamina and persistence of the females in chasing him down. But yeah for sure I'm pretty sure the reason we don't see any named females is because it's an otome game :'). I honestly feel that they're probably mixed in as servants or just generally chilling around because no one talks about female Gekkazoku like they're really rare or special. Okay, my impression on Kagemochi has somewhat improved. I like people who can teach. Is it that easy?? Or is it just for the sake of the plot?? And he’s so nice :’D heehee, I’m curious to see what your reaction to him will be in the next chapter where he reveals more of his “true” colors. LOL I felt like she didn’t learn much at all… just a single sentence before Kagemochi was like “Alright, I’ma read the rest now”. But then again she can communicate with them and just has troubles recognizing the letters so maybe it’s much faster if you already know the language but just need to learn to read. It’s hard to imagine for me but I guess it’d be like speaking/understanding English but just not being able to read? But if someone sounded all the letters out to you, you’d be like “ah, I recognize these words now”. HE TOTALLY SOUNDED LIKE THAT TOO. He was like stuttering and really loud like “UM NAH I’MA LEAVE!” which was really weird. In general Imari doesn’t seem comfortable around the vampires or werewolves though but sticks around them (if he’s discovered) to be with Yuzuki. He lits up all the signs of “dangerous man”. Doubly dangerous for his gentle outward manner. When you think about it, it’s rather confusing. I mean, do they talk Japanese, only that they have different letters? Or is it that whenever she talks, it’s magically translated to Shinga’s language? But if it is the latter, shouldn’t the magic extends to written form as well? Or is the magic really half-baked like that? I wonder why? Is it really just because Imari is uncomfortable around them? Or is there something else? Hmm, maybe it’s something like really cursive handwriting for us LOL. Like that can be hard to read if you’re not used to reading handwriting but once you realize what the word is you’re like “oh yeah I totally understand I just have to remember what the form looks like”. Ooor magical google translate only applies to verbal language like you said– //bricked. Hmm, that’s really interesting. But what happened to the military? And what of the town in the Date story that seems to be a Yakuma nest? I personally think that the yakuma is former “Gekka” tribe members whether werewolf, vampire, or oni. I think that after Himemiko disappeared they became corrupted or mad with thirst and changed. Or something or someone caused them to change and Himemiko disappeared into our world. Someone must of sent her to our world or she sent herself to our world to protect the power in her blood She then was reborn as Yuzuki and lost her memory. That’s why it doesn’t make sense as her attendant Imari has no clue about her disappearance or yakuma. As her attendant you would think he would have been with her until the end. Unless she tried to save him and gave him the clue to find her reborn self before she disappeared. And that’s why it seems like he was looking for Yuzuki for such a long time. But then again I could be so off with my theory. My theory for now is that the military becomes the yakuma, which can explain why they just disappear so suddenly. But I still have my doubts. And we don’t have enough information yet. Haha, that’s the question, isn’t it? I’m totally with you on your theory though. It’s heavily hinted in Date’s story that the town they came across was the capital where Himemiko stayed with her military government. In Oda, Nagahide talks about how Himemiko gave powers to her military that made them stronger than the other Gekkazoku so it’s weird that they were destroyed by the yakuma *coughs*. I totally think they changed into yakuma too and that it’s because of Himemiko… either she realized her blood slowly corrupted them or maybe some evil was slipping into the world, maybe. The rest of is just theory; either she died, got forcibly returned to her original world (if she was even a dimension traveler), or maybe she sacrificed herself to seal away a greater evil that was turning things into yakuma– //bricked. Honestly way too many questions and too few answers still. I don’t know what I think about Yuzuki’s connection to Himemiko still and why she can activate Himemiko’s sacred treasures, hmm. I’m also a bit confused on the timeline too. Like it sounds like Himemiko disappeared a REALLY long time ago but it also sounds like Motonari was alive during the time he was gonna take Mouri into the capital to fight Himemiko and her government LOL (don’t quote me on this because my memory is really foggy and I should really go back and check that out). Garden: I’m totally with you on this one. But, if you think of this (just like who it happens with pure raze dogs). The mating of the whole clan with the same woman, eventually would be one of the reasons for the weakening powers. Even if they mate with different women from only their own clan, it would be a disadvantage. Ideally, they should mate between clans. !! I never thought about Yuzuki being a descendant of Himemiko. That’d be really interesting too. There’s just still too many mysteries about the mysterious disappearance of Himemiko. Did she do it by choice? Was she forced? What the heck are the yakuma!! That’s what I’ve been thinking re: Gekkazoku and their (lack?) of females or just in general their weakening blood. Like they sound rare enough compared to the population of humans and so at one point even if they have equal male to female ratio, they’ll slowly run out of people to marry and need to inject some fresh blood. I’m just assuming they’re limited to either breeding with their own race (so no vampire/werewolf hybrids) or humans (because we’re so genetically diverse and bland but it’ll weaken their blood). I must have been too distracted by Midorikawa’s deadly voice that I didn’t realize he was explaining some of the world building of Shinga. so I guess way back when Himemiko was around, the Gekka tribe’s default form must have been the awakened form? and because they were separated by regions after Himemiko’s MIA, some ‘evolved’ into specific current race of vampires and werewolves? so it seems that the ancestors of original Oda and co. must have lived very far away from the other werewolves tribe. that’ll explain why there’s only a few vampires than werewolves. but what of the onis? still no explanation why there’s no female Gekka tribe too. is there really a female Gekka tribe? I remembered that Uesugi had one of the most detailed explanations of Shinga’s past but I couldn’t remember the details either so coming back to this chapter and translating things really helped (not to mention we also have more chapters released in general). I think so too about the original Gekkazoku’s default state being their awakened forms, though now I’m curious what they looked like if oni, werewolves, and vampires are branch offs. Gods, I wish I had better memory for Mouri right now but weren’t the oni around very close to Himemiko’s time? That’s some fast evolution (unless Himemiko was also around when they started evolving into their current state). I don’t think there’d be a female Gekka tribe? Like the werewolves would have had females and males in their group already and etc etc. It’s just that the purity of blood slowly diminished the less blood they had from Himemiko… I guess?? Or like they had to introduce human blood too because the Gekkazoku already sound small enough and so at one point they’d run out of same species blood to marry, especially if the Gekkazoku not only split off even more and became different races but also established their own fiefdoms. You wouldn’t want to marry your children off willy-nilly to a rival fiefdom, etc. RIGHT?! About Himemiko. Everything is just too “similar” that it’s super suspicious. I’m so darn curious as to what happened to Himemiko because her peace-ing out and throwing Shinga back into war is such a douche-y move, haha.